Our versatile padded hard shell protective case with zipper securely holds 5-inch GPS devices, including TomTom Go 50 500, Start 50 55, Garmin nuvi models 2595LMT, 3597LMTHD, 3590LMT, 50LM, 2555LMT, 2597LMT, 560LMT, 1490LMT, 2577LT, 2557LMT, 2460LMT, and Garmin dezl 560LT, 6-inch GPS devices, including Garmin nuvi models 65LM, 65LMT, 66LM, and 66LMT, as well as 6-inch TomTom models Go 60, go 600, VIA 1605TM and Start 60, and 7-inch GPS devices, including Garmin nuvi models 2797LMT, 2757LM, 2798LMT, Garmin dezl 760LMT, Garmin RV 760LMT, and Garmin 2978. 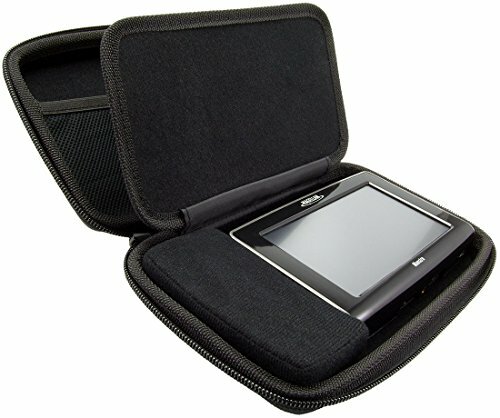 The case also holds 7-inch Magellan Roadmate models 1700, 9055, 9250T-LMB, RM9200-LM, and RV9145-LM. Some midsize tablets (7" screen size), including the Kindle Fire, also fit in this case. You can even store headphones, including the Bose AEZw. This sturdy, padded hard shell protective case measures 7.25 inches long x 4.5 inches wide x 1 inch thick. The zippered case has a built-in pad to protect the device's screen, as well as a removable pad to be used with 5-inch GPS devices. A handy pocket on the inside lid of the case keeps charger cords or other accessories organized.